Landfall on Ibiza - San Antonio. 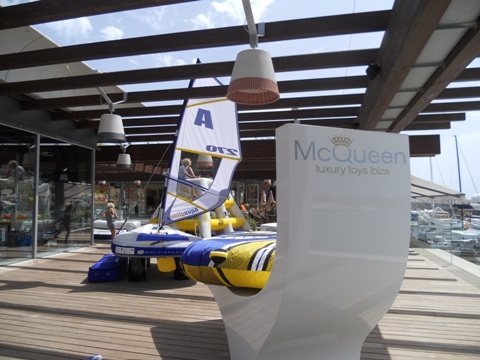 If you read our last update, you will know that our next destination was Ibiza. 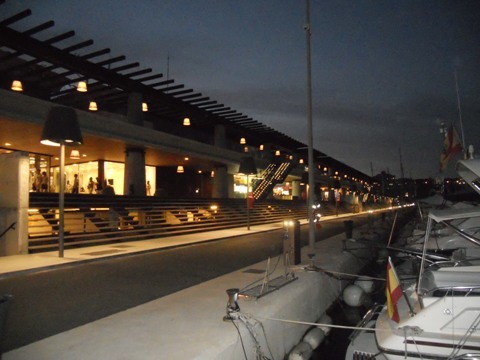 We left Denia early on Tuesday 24th July and had the sails up before we had cleared the entrance canal. They stayed up until we were about 3 miles from San Antonio, Ibiza. 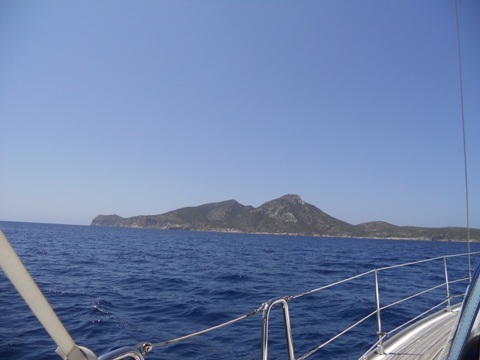 Although the sea was slightly 'lumpy' at first, it calmed down after a couple of hours and, with one reef in the main and full genoa, we had a perfect, comfortable crossing in glorious sunshine. We learnt long ago that once the wind speed reaches 12 or 13 knots on the beam, with one reef in the mainsail we go no more slowly than with full sail, but have a more comfortable and less tiring ride. With only two of us and a 60 mile passage this is important. We arrived in the anchorage in San Antonio and after a couple of failed attempts managed to find some sand in which to drop the anchor. Then I got my gold lame suit out and headed for the disco. No I didn't, I made that up... Instead we had sundowners and reflected on what had been a perfect passage. The next day we just relaxed, although we did spend about 4 hours at the computer registering with two websites (Ports IB and Posidonia Buoys) that now enable us to book berths and buoys in the Balearics online. It's amazing how long these things take. 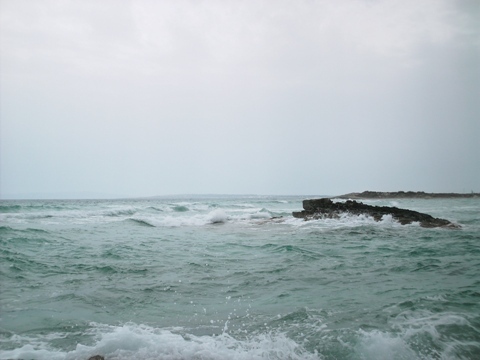 The following day we headed for Espalmador, a small low lying island at the northern tip of Formentera. 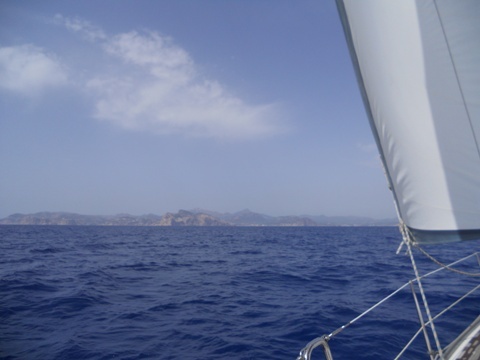 We initially had a relaxing sail down the west coast of Ibiza, reefed in preparation for the gusts off the cliffs that we had read about. Then, as we rounded Cabo Jueu it all changed - a very lumpy sea with swell and 20 knots of wind on the nose. 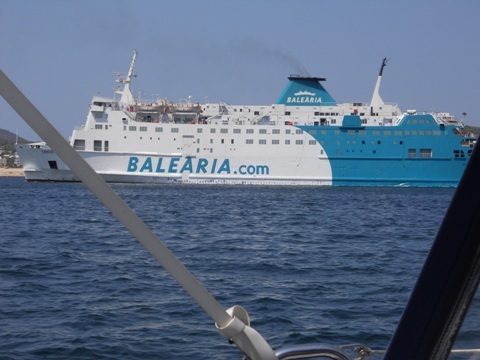 We contemplated heading for the nearby Port Roig, but we had booked a buoy at Espalmador for two nights so pressed on - it was a very unpleasant 2 hours. Things calmed down once we were in the anchorage but it was still blowing 15 - 20 knots as we meandered through the buoys looking for ours. 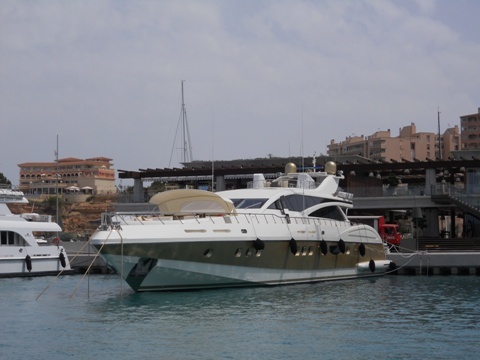 When we eventually found it a Spanish boat was already on it - as someone was on the one he had booked! 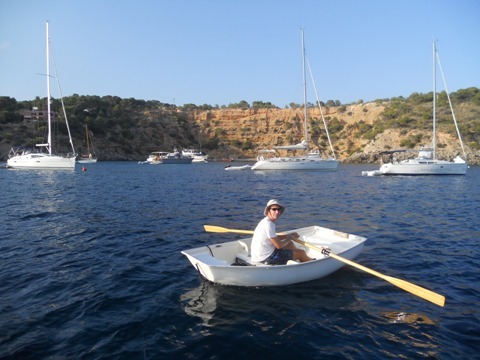 He was quite helpful though and launched his dinghy to explain to the Germans (yes, sorry Jana!) who were on our buoy that we had in fact booked it. They duly moved and we secured successfully to the buoy, just in time for the thunderstorm that had been brewing all the while to do its thunder & lightening thing and drop a little rain. We were relieved to be there, but there was more to come... At about 0100, the wind suddenly increased from a modest 15 or so knots to 38! The buoys are rated for a maximum of 16 knots, so we weren't sure whether we were pleased or worried to see everyone on deck watching, checking and with nav lights on ready to evacuate! We had our engine running with an escape route planned if the buoy suddenly let go, but after about 45 minutes the wind subsided to a more sleep conducive 12 knots, so we retired to bed (again). In the morning we awoke to find that there had been just enough rain to completely coat Pipit in a layer of reddish brown sand - we presumed from Morocco way - completely undoing our thorough washing in Denia. All we could do for now was to sluice the coachroof and decks with salt water, as everyone else was also doing, but all the canvas, rigging, wind generator and solar panel remained coated. A little later we moved to our rightful buoy once the Spanish boat had left. This was in fact a particularly nice spot, just off the beach. We swam ashore and wandered along the beach. Also, Rob & Rhian on Beyzano recently wrote about the varying anchoring techniques of different nations - very funny and a bit too near the truth! 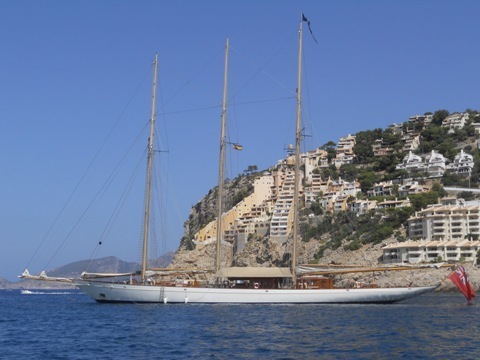 Our second night at Espalmador was calm and peaceful and on Saturday morning we had a short slow sail back to Port Roig, a lovely little cala on the south coast of Ibiza. 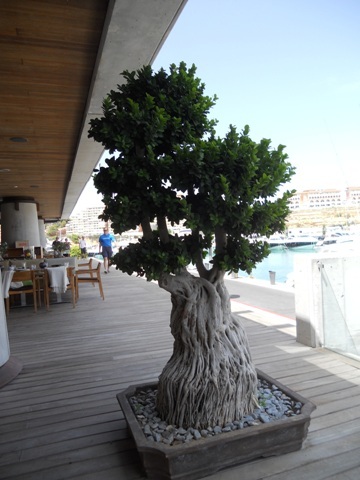 We had two nights there, relaxing, swimming and pottering in the dinghy by day and on Monday morning we returned to San Antonio, this time to the Port Authority marina so that we could fill up with water and go shopping. Oh and thoroughly wash the boat - again. 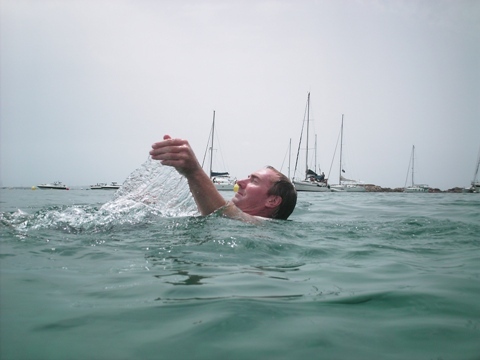 Regarding the water, we'd read that water on Ibiza is at best not very nice to drink and sometimes even brackish. I asked in the Port Authority if it was ok to drink and was told "We don't drink it, tastes of chlorine, but the government says it is safe. My mother uses it to cook." Anyway, we tasted it and could tell no difference from any other water we've filled up with since Plymouth, so in went 300 litres. Morning constitutional in Port Roig. 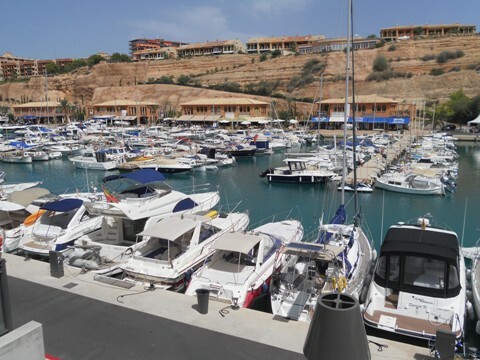 The Port Authority marinas are bookable online and are far more reasonably priced than most of the commercial ones - about €38 a night for us, including water & electricity. 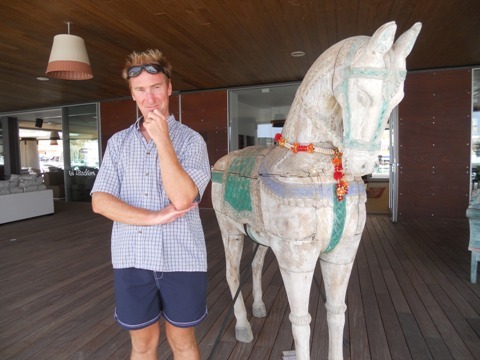 Our most amusing quote so far was in Ibiza town, €240 for one night. Plus water. Plus electricity. Plus IVA. We went to San Antonio instead. 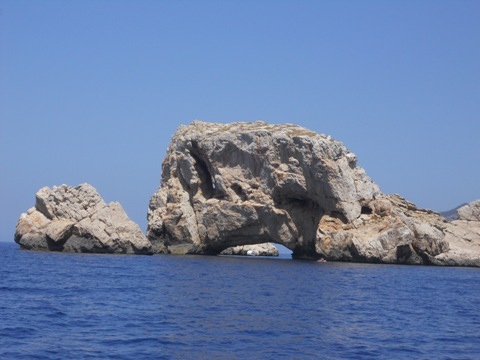 On Tuesday morning we had a second round of shopping and after lunch set off round the north west coast of Ibiza, heading towards Cala Blanco, our departure point for Mallorca. We had a gentle sail in a flat sea for a while but later had to revert to Volvo power. We did get to pass inside Isla Margaritas though, probably not feasible in anything other than calm conditions. 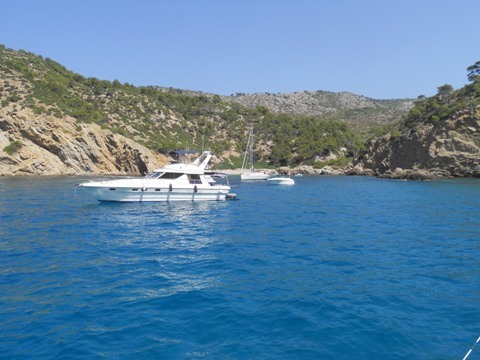 We arrived at Cala Blanco to find just 6 other boats there - I think the most delightful cala we've yet visited - crystal clear water, no swell, nothing ashore other than a couple of private dwellings and very peaceful. 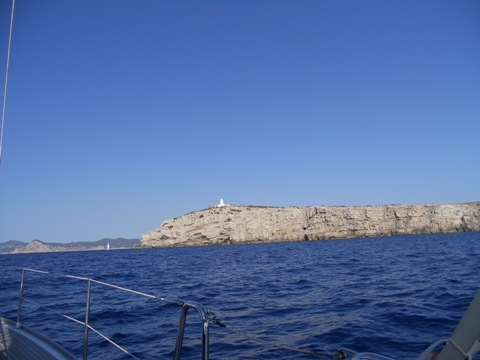 We arose early on Wednesday morning and were sorry not to be spending another night where we were, but the forecast was still perfect for crossing to Mallorca, so we had to go as the wind was forecast to change the next day. If our crossing from Denia to Ibiza was almost perfect, the passage to Mallorca was even more so - the wind was just as forecast, as was the swell (none really) and we sailed all but the first hour or so right into the anchorage at Santa Ponsa where, although fairly busy, there was still plenty of room to anchor. We stayed for two nights and on Friday motored the short distance to Andraitx, where we had a spin around the harbour to see how much of it I could remember, for it is in these waters that it really all began for me, back in July 2003. My good friend Samir invited me then to join him & his family aboard a Beneteau Oceanis 393 that he had chartered and, although I'd had the odd day sail on small yachts previously, this was my first experience of this type of boat and the lifestyle, and I rather enjoyed it! Who would have thought that not many years later I'd sail, with Ann whom I'd yet to meet, our own boat from Plymouth to these same waters? Not me, so thank you Samir, and thank you for your continuing professional advice in helping make Project Tethys viable. Landfall on Mallorca - Santa Ponsa. Adix in Andraitx - last seen by Ann some 25 years ago in Sydney! Whilst on the subject of thanks, more are due to my sister. Whilst we were in the Mar Menor, we received an email from the storage company in the UK informing us that a fire in an adjacent building had caused smoke contamination and that the entire contents of our unit had to be removed or disposed of. All rather upsetting as although we have very little of any financial value in storage, there are quite a few sentimental items that we'd be most distressed to lose. It was looking like we'd have to leave Pipit somewhere and fly to the UK to spend half a day assessing the damage and/or moving our possessions to a different storage facility. A phone call to the company made us feel a little better; it seemed that some other people who had already inspected their units reported that there was very little evidence of smoke contamination, and if that was the case with ours then the contents of our unit could be moved to another floor. So my big sister to the rescue - she made time in her hectic schedule to go and inspect our 'stuff' - except not only did she do that but as it seemed ok she moved it all to another unit for us as well! So thanks again Gill, much appreciated. Lunch stop just past Andraitx. Time for a cooling dip. We had a restless night as, in very light winds, the mooring buoy spent half the night banging against the side of the hull. The next day we launched the dinghy and rowed along the shoreline, where we were watched by a few goats, before the sun came up over the cliffs. Later I re-attached the anchor chain shackle to the hole rather than the slide in the Manson Supreme. The idea of attaching it to the slide is to aid recovery should the anchor become fouled but, being able to snorkel over the anchor now, we have seen that in very light winds if Pipit swings, sometimes the shackle rides along the slide to the head of the anchor, rather than the anchor turning and re-setting. If the wind should then rise in the new direction, there's the real possibility that we'd pull the anchor out, so we'll monitor what happens with the more conventional attachment. 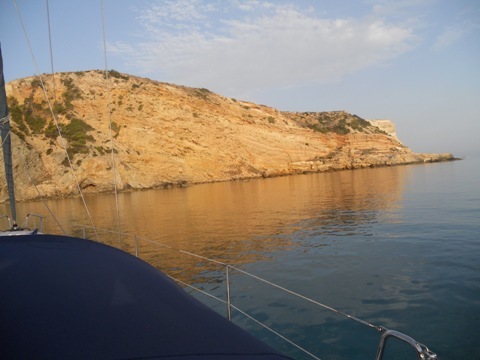 The following day we returned east, hoping to stay overnight at Cala Blanca, but there was quite a bit of swell rolling in there and a surprising amount of rubbish in the water so, after looking at and dismissing a couple of other spots, returned to the anchorage at Santa Ponsa. Overnight, we had just enough rain again to re-coat Pipit in another layer of sand - cue another sense of humour failure! 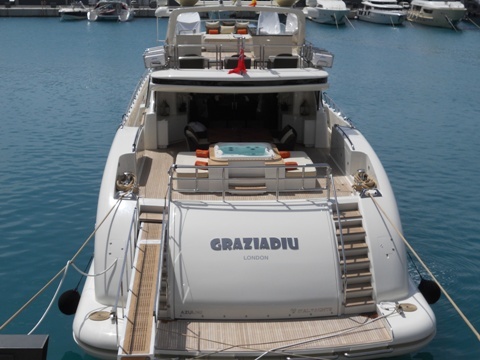 We motored the short distance to Port Adriano, where we were allocated a berth on the floating pontoon on the outside of the inner breakwater. This was quite bouncy and the forecast was for increasing swell, so I enquired about a berth inside. The initial response was "sorry, no room" but after an extended conversation with colleagues and a phone call hey presto! A berth was available just about as far inside as one could get! 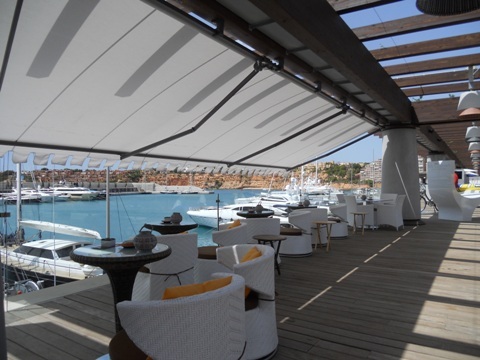 Port Adriano is without doubt the most opulent and prestigious marina we've yet been to, catering for 60 metre superyachts. 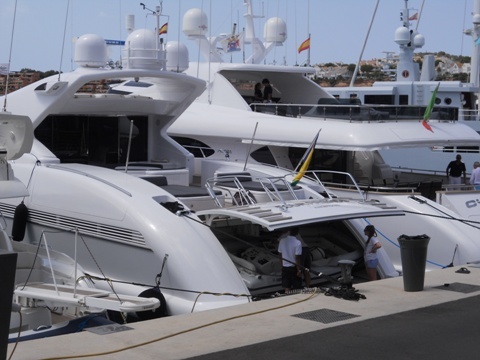 Our berth was on paupers' row, in between an older Sunseeker and another motor boat and I had to power backwards between them to make room, Ionian style! Nonetheless the staff and marineros have not forgotten us 'umble types and were very friendly and helpful and although €60 per night seems outrageous by our previous standards, in these parts that's really quite reasonable, especially given the pleasantness of the surroundings. Paupers' row - Pipit bottom right. We will stay here for another night to wash the boat (again! 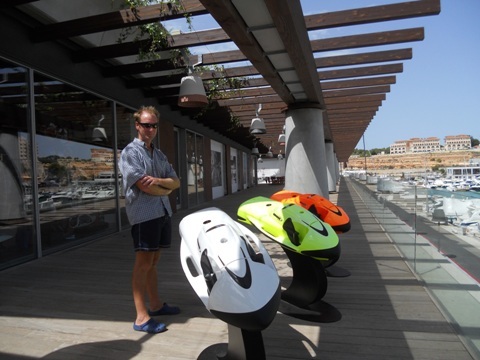 ), shop and catch our breath before moving round into Palma Bay. PS - We've not updated the voyage map yet, it takes a while and frankly it's just too hot!